A picture taken of the Kodak Theatre in Hollywood & Highland near Los Angeles, California. 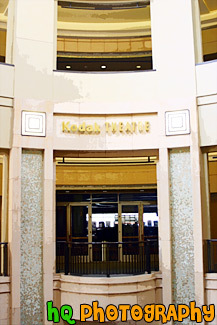 The Kodak Theatre has also become the world's only live broadcast theatre. It has been custom-designed for the special needs of Oscar Night and other live TV broadcasts. The Kodak Theatre is also home to the finale of the popular TV show, "American Idol." Every season a new American Idol is crowned here! The theatre is sponsored by the Kodak Company, which paid a record $75 million to have its name emblazoned on the new auditorium. A scenic picture of the famous Los Angeles landmark, the Hollywood sign. 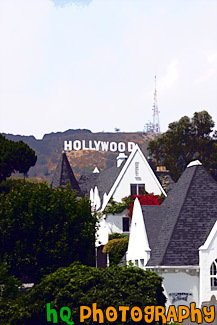 This sign is located on the hills just north of the Hollywood strip and was taking with a scenic white, pointy house in the foreground. The Hollywood Sign originally said "Hollywoodland" in 1923 before it was shortened in 1945. The Hollywood Sign is the most famous sign in the world. 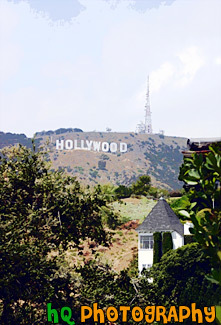 It is located on Mount Lee in Griffith Park overlooking the city of Hollywood. 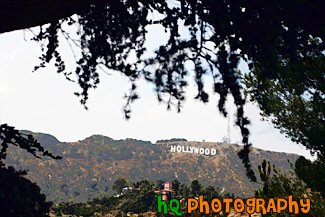 It's illegal to hike to the Hollywood Sign, but there are many good vantage points from the streets of Hollywood. The Sign is a trademark of the Hollywood Chamber of Commerce. The Sign was declared Los Angeles Cultural-Historical Monument #111 in 1973 by the Cultural Heritage Board of the City of Los Angeles. A scenic picture taken close up of the famous Los Angeles landmark, The "Hollywood" sign. The Hollywood Sign originally said "Hollywoodland" in 1923 before it was shortened in 1945. The Hollywood Sign is the most famous sign in the world. 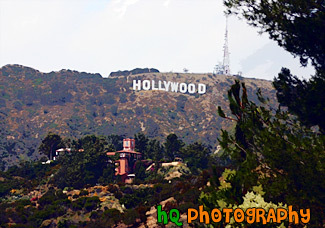 It is located on Mount Lee in Griffith Park overlooking the city of Hollywood. 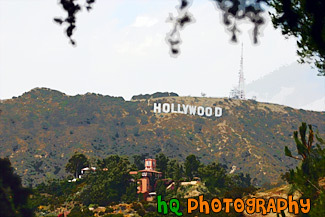 It's illegal to hike to the Hollywood Sign, but there are many good vantage points from the streets of Hollywood. The Sign is a trademark of the Hollywood Chamber of Commerce. This is a picture taken of the famous Los Angeles landmark, The "Hollywood" sign. The Hollywood Sign originally said "Hollywoodland" in 1923 before it was shortened in 1945. 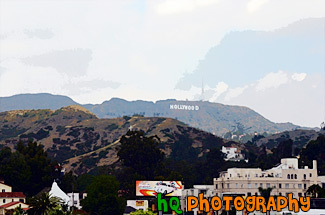 The Hollywood Sign is the most famous sign in the world. 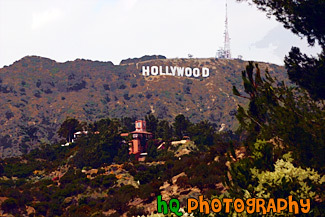 It is located on Mount Lee in Griffith Park overlooking the city of Hollywood. 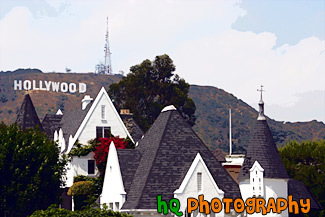 It's illegal to hike to the Hollywood Sign, but there are many good vantage points from the streets of Hollywood. The Sign is a trademark of the Hollywood Chamber of Commerce. The Sign was declared Los Angeles Cultural-Historical Monument #111 in 1973 by the Cultural Heritage Board of the City of Los Angeles. 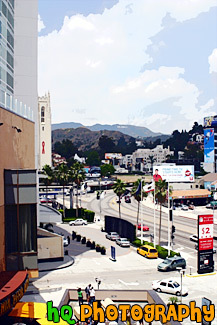 A scenic picture of the famous "Hollywood Sign" looking north along Highland Ave. at Hollywood & Highland. This picture is taken near the Kodak Theatre. The Hollywood & Highland center is located in the heart of Hollywood, California and contains the Babylon Court. The new Hollywood & Highland center is the same center that contains the Kodak Theatre. 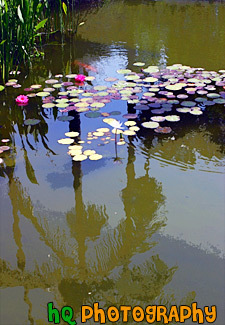 A scenic picture of a flower, water lillies, and reflection of a palm tree taken at Rogers Memorial Park in Beverly Hills, California. The Will Rogers Memorial Park was the first municipal park in Beverly Hills, originally opened under the name of Sunset Park in 1915. The park was renamed in 1952 to honor the entertainer and honorary mayor of Beverly Hills, Will Rogers. A scenic picture taken of the center of Babylon court and one of the two large elephants that loom over the court. The Babylon Court is located in downtown Hollywood, California amongst the Hollywood & Highland shopping and entertainment complex. 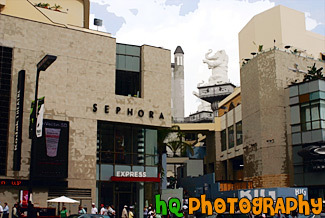 A scenic picture taken of the famous Hollywood and Highland center in located downtown Hollywood, California. In the background of this photo you can see the El Capitan Theatre. 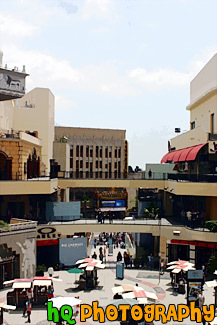 The Hollywood & Highland center is located in the heart of Hollywood and contains the Babylon Court. The new Hollywood & Highland center is the same center that contains the Kodak Theatre, where the annual Oscars show is held, and a few steps away from Grauman's Chinese Theatre. A scenic picture of the Babylon Gate at Hollywood and Highland with the tourists taking pictures on the different levels of the gate. 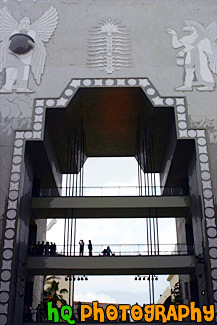 The Babylon gate is the monumental entrance to the Hollywood & Highland project in Hollywood. The Hollywood & Highland center is located in the heart of Hollywood, California. The new Hollywood & Highland center is the same center that contains the Kodak Theatre, where the annual Oscars show is held, and a few steps away from Grauman's Chinese Theatre. A scenic picture of the Beverly Hills, California City Hall located in downtown Beveryly Hills on the outskirt of Los Angeles. The Beverly Hills City Hall has gracefully presided over the city's civic life since 1932. Architect Willliam Gage created the Spanish Renaissance building in typical government style of that era. The beauty of the building, with its tiled dome and gilded cupola, soon transcended the typical government building and has become a beloved local landmark of Beverly Hills. The city of Beverly Hills was wealthy and famous long before it was discovered by the movie industry. At the beginning Beverly Hills was blessed with a commodity more precious in Southern California than jewels: water. 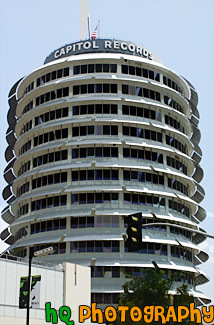 A close up picture taken of the Capitol Records building in downtown Hollywood, California on Hollywood and Vine St. Capitol Records was the first record company based on the West Coast, and has promoted artists such as The Beatles, the Beach Boys, Pink Floyd, Frank Sinatra, Bob Seger, Duran Duran, Bonnie Raitt, Robbie Robertson, Steve Miller and Tina Turner. Since 1954, the company has been located in the world's first circular office building. 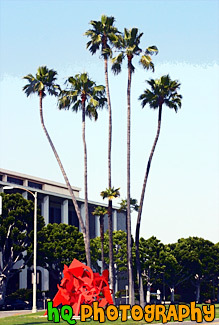 A scenic picture taken of downtown Beverly Hills, California of some interesting shaped palm trees and a red structure. The city of Beverly Hills was wealthy and famous long before it was discovered by the movie industry. At the beginning Beverly Hills was blessed with a commodity more precious in Southern California than jewels: water. A scenic vertical picture taken of the fountain at Will Rogers Memorial Park located in the Beverly Hills area of Los Angeles, California. 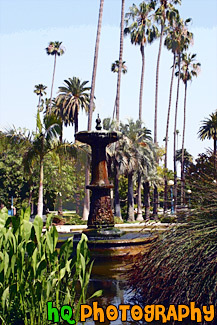 Blue sky and palm trees are seen surrounding this fountain. 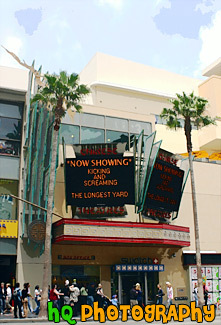 A picture taken of Grauman's Chinese Theatre located in Hollywood, California. The most spectacular theatre opening in motion picture history belonged to the grand opening of Grauman's Chinese Theatre in Hollywood in May 18, 1927. The theatre rises 90-feet high and two gigantic coral red columns topped by wrought iron masks hold aloft the bronze roof. Between the columns is a 30-foot high dragon carved from stone. Guarding the theatre entrance to this day are the two original giant Heaven Dogs brought from China. The Chinese Theatre in is the most famous movie theatre in the world. Millions of visitors come here each year, most of them drawn by its legendary forecourt with its footprints of the stars. 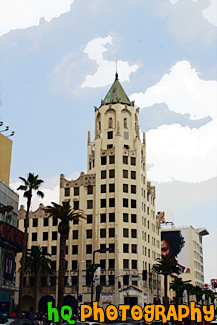 A scenic picture of the Hollywood First National Building located in downtown Hollywood, California near Los Angeles. This building was built by architects Meyer & Holler in 1927 and is known as a historic site. This combination of Gothic and Art Deco was created by the same architects who designed the Chinese Theater which is located down the street. From 1927 to 1932 it was the tallest building in the city. 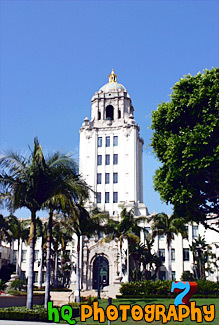 However, Los Angeles City Hall was built in 1932 which became taller. The Hollywood First National Building is currently an office building that will be undergoing renovation by its owner since 1999. It is one of the most beautiful and detailed buildings on Hollywood Boulevard (at the corner with Highland Ave.) This building was constructed for the sum of $750,000 in 1927. 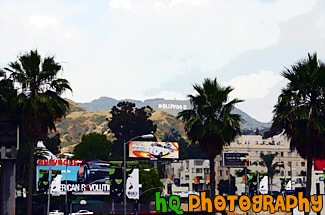 A scenic picture taken downtown Hollywood, California of the Hollywood History Museum sign. 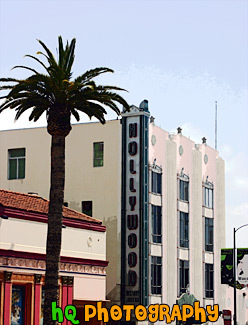 The Hollywood History Museum is located at 1666 N. Highland Ave which is less than a 100yds. from Ripley's Believe it or Not. It is located inside the Max Factor Building and is Hollywood's newest major attraction. Four entire floors are dedicated to exhibits from Hollywood's most memorable era. Hollywood History Museum, Highland Ave.
A scenic vertical picture taken of the Hollywood Sign on the hill in Los Angeles, California. Partly cloudy, blue sky is seen above. 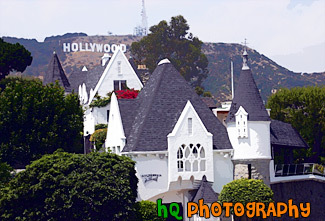 A scenic picture taken of a white house with the famous Hollywood sign seen in the background on a hill. A scenic vertical picture taken of the famous Hollywood sign sitting on a hill behind this white house in Los Angeles, California. A scenic picture taken of the Hollywood Sign and palm trees from Babylon Court at Hollywood and Highland Ave.
A scenic picture taken of the famous Hollywood sign seen on the hill in the distance. In the foreground are tree branches framing the Holloywood sign. A scenic picture taken of the famous Hollywood Sign sitting on the hill in the distance taken from dowtown Hollywood, California. This picture was taken on a partly cloudy day. Some buildings can be seen in the foreground. A scenic vertical picture taken of Los Angeles from on top of a hill. 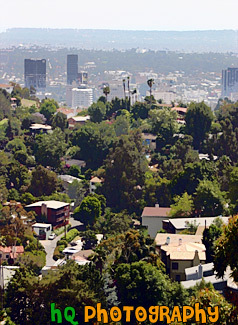 In this picture you can see the Capital Records building which is located in downtown Hollywood. A picture taken of downtown Hollywood, California. 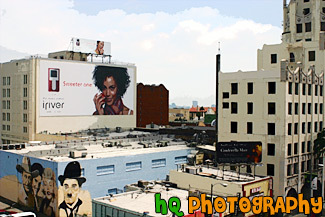 This picture was taken from Babylon Court located on Hollywood & Highland Ave. 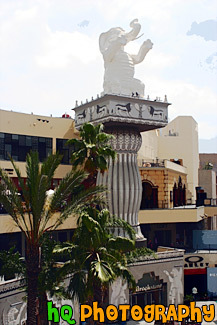 The Hollywood & Highland center is located in the heart of Hollywood, California and contains the Babylon Court. The new Hollywood & Highland center is the same center that contains the Kodak Theatre, where the annual Oscars show is held, and a few steps away from Grauman's Chinese Theatre. 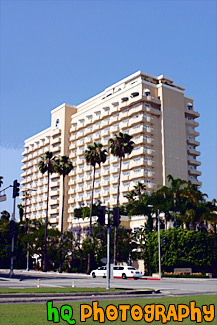 A scenic picture taken of a hotel located in downtown Beverly Hills, California. A limousine is driving in front of the hotel on this beautiful sunny day. 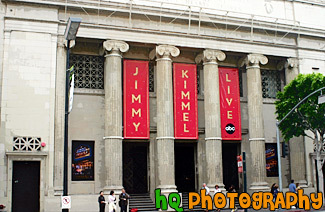 A close up picture taken of the Jimmy Kimmel Live building where he hosts the late night television show. Jimmy Kimmel has been on cable's "Comedy Central" channel for several years, as a former co-host with Ben Stein on "Win Ben Stein's Money" and as a co-host with Adam Carolla on "The Man Show." Now Jimmy Kimmel is at a late-night network spot with ABC. A few of the front of the Kodak Theatre from the inside of the Hollywood & Highland Center. This 136,000 square foot theatre is the cornerstone of the new Hollywood & Highland development. 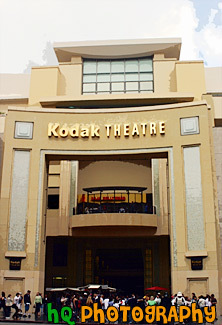 The Kodak Theatre has also become the world's only live broadcast theatre. As such, it has been custom-designed for the special needs of Oscar Night and other live TV broadcasts. In the past, seats had to be taken out at other venues to make room for the TV cameras and other equipment. Not so at Oscar's new home - the Kodak Theatre. During live broadcasts, a unique "media cockpit" will rise above the center of the orchestra seating, and will act as the technical heart of the production, containing television cameras, sound & lighting equipment. The Kodak Theatre is also home to the finale of the popular tv show, "American Idol." Every season a new American Idol is crowned here! A scenic picture taken of the famous Los Angeles Hollywood Sign sitting on the hill. 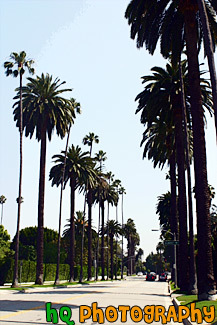 A scenic picture taken of many palm trees alternating between tall and short along a road perpendicular to Sunset Blvd. in Beverly Hills, California. 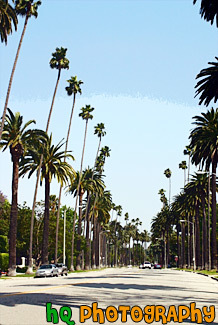 A scenic picture taken of the hundreds of palm trees located in Beverly Hills while approaching the famous Sunset Boulevard street. This picture was taken on a sunny day with blue sky above the palm trees. Sunset Boulevard is one of the world's most famous streets. Sunset Boulevard passes through Hollywood, then becomes the Sunset Strip as it passes through West Hollywood, weaves its way through Beverly Hills and Bel-Air, and finally winds its way through the rustic foothills of the Santa Monica mountains, to finally end at the Pacific Ocean near Malibu. Palm Trees Leading to Sunset Blvd. 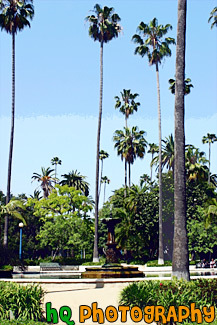 A scenic picture taken of the tall palm trees surrounding the beautiful Rogers Memorial Park located in Beverly Hills, California. The Will Rogers Memorial Park was the first municipal park in Beverly Hills, originally opened under the name of Sunset Park in 1915. The park was renamed in 1952 to honor the entertainer and honorary mayor of Beverly Hills, Will Rogers. 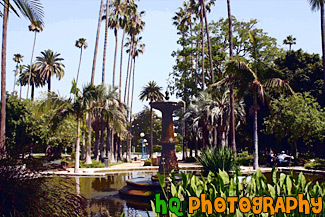 A scenic picture taken of the water fountain in the middle of Will Rogers Memorial Park located in downtown Beverly Hills, California. There are many pretty palm trees surrounding this beautiful park as you can tell in the picture. The Will Rogers Memorial Park was the first municipal park in Beverly Hills, originally opened under the name of Sunset Park in 1915. The park was renamed in 1952 to honor the entertainer and honorary mayor of Beverly Hills, Will Rogers.